The battleground this year will be in the regional space. Mainline broadcasters like Zee Telefilms, Star India and MTV have designs to spread south, the most lucrative regional market. On the other end pf the pendulum is Sun, a dominant player in the region, which is eyeing growth in the non-South market. Regional news channels are also going to be part of the fight. The ABP-Star Group joint venture is planning to launch a Bengali news channel. Joining the battle will be Sahara and Rathikant Basu's Broadcast Worldwide. Subroto Roy's Sahara Samay, in fact, has announced plans to launch six regional news channels including Tamil, Telugu and Malayalam. Niche channels have dubbed content in local languages to penetrate mass audiences. But Walt Disney has taken a leap forward by launching Toon Disney channel in Telugu and Tamil languages. It remains to be seen whether this will work for Disney even as it is struggling to put distribution in place. But the message is clear: big players can't ignore regional markets as they stretch out their growth plans. Here is a take on how the regional channels have fared in the year gone by. The stage is set for a bigger play in the south. While Sun Network is planning to trek north, mainline broadcasters like Star and Zee Telefilms are eyeing an expansion into more southern states. Sun, in fact, struck one of the biggest media deals in 2004. Promoter Kalanithi Maran signed a $ 25 million joint venture agreement with Malaysia's Astro All Asia Network to originate, aggregate and distribute television programming and channels for a global audience. This will allow Sun Network to launch a host of regional channels globally. And the Bengali channel will be distributed in India as well. With this, Sun can begin its journey into the non-South market. In the southern region, Sun Network continued to dominate except in Kerala where it is in fierce competition with Asianet. In Tamil, of course, Tamil language channel Sun TV rules the roost and is also the network's top revenue-earner. Gemini (Telugu) and Udaya (Kannada) are the next biggest contributors, followed by Surya. Among the network's secondary channels, KTV (Tamil movie and events channel) is at the top slot followed by Teja (a hybrid Telugu movie and infotainment channel) and Ushe (a Kannada channel airing movie-based shows, countdowns and interviews). 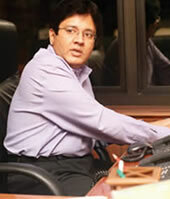 Maran is not resting with the success of his channels. He entered into his first ever deal with a Hollywood studio to fortify the network's movie content. The aim of the multi-year deal with Buena Vista International Television - Asia Pacific is to exploit the dubbed movie content across the Sun network channels. Rival channels Vijay TV and Jaya TV had already started screening dubbed Hollywood movies in the early part of the year. By sewing up the deal, Sun Network now plans to introduce dubbed Hollywood movie slots in Tamil (Sun TV and KTV), Telugu (Gemini) and Malayalam (Surya TV). Also in Maran's agenda: to launch this year a 24-hour Telugu music channel, Aditya, and a Malayalam movie-and-song channel, Kiran. In 2004, the network launched SCV, a Tamil music channel. Subhash Chandra is not sitting quiet. After abandoning his south ventures a few years back, he staged a comeback with the launch of Alpha Telugu. And he is planning to make an entry into the other southern languages through the Alpha brand. Rupert Murdoch's Star Group is also busy drawing a roadmap. By buying out UTV's 44 per cent stake in an all-cash deal for approximately Rs 310 million, Star now has complete hold on Vijay TV. This frees Star from expanding in the southern region through UTV, as it is no longer bound by a non-competitive restrictive clause. It remains to be seen how and when Star approaches the other south language markets. For Raj TV, it was tough going. The network lost its teleport licence. The government's charge: Non-renewal of licence and up-linking of two channels - Vissa TV and Raj Music - without permission . The channels are now forced to uplink from Bangkok in Thailand at a higher cost. The year proved fruitful for the two Malayalam channels, Kairali TV and Indiavision. Kairali finally turned around to rake in profits while Indiavision grabbed attention with live coverage of some sensational news. On a high, Indiavision is now planning to put its distribution in place across the country. On the programming front, there were some distinct trends. 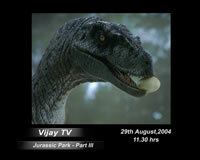 Tamil channels experimented with the reality genre in 2004. Vijay TV recently launched Azhagi, a search for the ideal Tamil woman, while Music channel SS Music conducted a talent hunt show, Voice Hunt. The crime genre also made its impact this year. With the crime shows on Udaya TV and ETV Kannada gaining popularity, Sun Network launched its own brand of crime shows in Tamil and Malayalam. 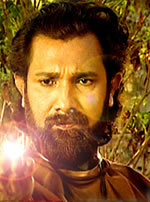 Battling for supremacy, Surya tried its luck with horror shows while Asianet introduced the folklore soap genre. Comedy shows also came of age with the Malayalam channels having at least one lineup in their prime time schedule. In the Telugu language market, two news channels made their entry. The launch of Teja News (from Sun Network) and TV9 was in addition to ETV Network's ETV2. Raj TV and Maa TV also introduced news segments in their entertainment channels. In a crowded and slow-growing marketplace, Bengali channels looked at news for growth. And why not? ETV was warming up audiences with 20 per cent of its programming dedicated to news. Tara Bangla also has an expanded band with news occupying one-fourth of the channel's content. 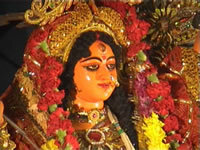 Even Alpha Bangla with varied content, has a two-hour news play daily. That is not where the story stops. Big players like Star and Sahara are planning to launch Bengali news channels in 2005, trying to get into virgin space in a state where audiences are hungry for news. Not to be left behind, Rathikant Basu-promoted Broadcast Worldwide which runs Tara Bangla is also planning a news channel launch by April 2005. Bengali channels are also tapping the Bangladesh market for growth. The reason: Bengali audience in Bangladesh is double that of West Bengal. Tara Bangla, which has a channel share of approximately 3 per cent in the Bangladesh market, holds 5 per cent of the Rs 1.5 billion Bangladesh television ad market. ETV Bangla and Alpha Bangla have also started thus, started eyeing this lucrative market. A reverse migration is also taking place. Bangladesh-based TV channels are chasing audiences and revenues in India. Some of the prominent channels from across the border available in India include the national channel Bangladesh Television (BTV), ETN Bangla, Channel I and NTV. 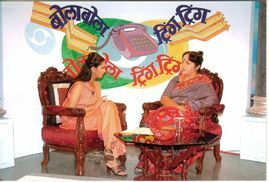 For Punjabi language channels, live events dominated the show in 2004. Market leaders ETC Punjabi and Alpha Punjabi, with about 80 per cent market share, conducted close to 20 events in the year. And this is getting bigger in 2005. The two channels have lined up as many as 25 events, way ahead of the rival channels. But Lashkara, which did four events last year, is planning to hold in February a big star-studded event in Dubai. Though music formed the core content in Punjabi channels, soaps telecast by Pakistan Television (PTV) and Hindi channels are climbing up in the popularity charts. Reportedly, in the rural areas of Punjab, PTV and Hindi channels are making inroads. The key driver for growth in Marathi channels this year was the state assembly elections. Be it opinion polls, roadshows, debates or interactive programmes - regional channels Alpha Marathi and ETV Marathi attempted possibly everything. While Alpha Marathi's USP was opinion polls, ETV stressed on the interactivity element. Much before the elections, an Alpha Marathi show created havoc in the state's political ambience. The programme Ghadalay Bhigadalay, which aired a satire on the then deputy chief minister Chhagan Bhujbal's alleged role in the multi-crore fake stamp paper scam, irked Bhujbal's supporters who attacked the office of Alpha Marathi. Bhujbal had to put in his papers owning moral responsibility for the attack. While Alpha Marathi dominated the Mumbai market, ETV remained unbeaten in rural Maharashtra. ETV Marathi claims to have recorded 5.5 per cent channel share in 2004, recording a 45 per cent increase over the previous year in the overall Maharashtra market. Alpha Marathi has improved its position to 4.2 per cent, up from 3.5 per cent a year ago. By launching more ground events and talent hunts throughout Maharashtra, Alpha Marathi is now taking the battle to ETV's camp for superiority in the rural market as well. Among the new initiatives, Alpha Marathi launched Apla Alpha awards (for the shows on the channel) to encourage competition among its own programmes. This year also saw Alpha Marathi training its guns on Hindi channels by stretching its primetime beyond the 10 pm band. So what is the trend in 2005? Regional channels will increase their focus on telefilms, events, crime and reality shows. Zee's regional channels, for instance, have already laid out plans to produce telefilms. Also expect consolidation to happen. A strong possibility for the major players is to take the acquisition route to gain foothold in markets where they had so far stayed away from.